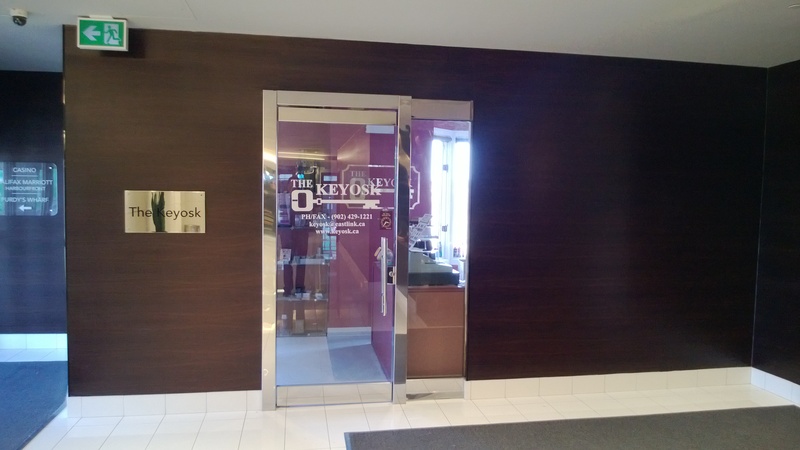 Welcome to the online home of The Keyosk! We have over 35 years experience and have been supplying keys, signs, awards, engraving, nametags, banners, and vinyl lettering to our customers since 1990. As the name suggests, we cut keys – while you wait – for residential and commercial locks and automobiles. We also carry key supplies: key identifiers, key tags, and colourful “personality” keys. We can order difficult-to-find, specialty keys upon request. We have engravable gift items for those special occasions: wine glasses, pewter steins, baby gifts, Zippo lighters, pen sets and more. We are happy to engrave items from other stores and can engrave most metals, glass, most plastics, wood, and inside rings. We have no set-up fees. 1903 Barrington Street, Halifax, NS B3J 3L7 (Barrington Place across from Scotia Square in downtown Halifax).